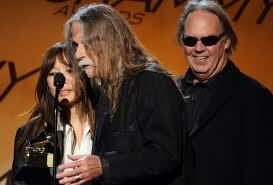 2010 Grammy Win for Neil Young Archives Vol. I | Gary Burden for R. Twerk & Co.
2010 was the year we broke Neil Young’s perfect Grammy losing streak. Surprisingly, he had never won a Grammy in his long career of making records. He was known in some circles as a Grammy Grouch due to his very vocal dismissal of the Grammy awards as a whole. He was in good company though because the Beatles and the Rolling Stones never won Grammys in their long careers. As a part of our art team, that all changed. My wife Jenice Heo, Neil and myself were credited as art directors on Neil’s monumental Archives Vol. 1 box set. I say monumental because that is what it is. It is a large box, a 250-page book chronicling Neil’s life from 1945 to 1972 in photographs, a Garypak that held 10- discs each in their own album cover package, a poster that was a visual guide to the archives and a hidden “stash box” that contained a bonus disc and other memorabilia. It was a very in depth piece of packaging artwork. I had worked on it for twenty years since our archivist Joel Bernstein started collecting images and Jenice had worked on it for ten years. In depth is an understatement. I had been nominated three times previously and Neil many times over the years. I was first nominated for the first Richard Pryor album, then Eagles One Of These Nights and the third was for Neil Young and Pearl Jam’s Mirrorball. All packages I am very proud of, but none struck Grammy gold. When Neil, Jenice and I were nominated for the box set I was most appreciative of the recognition but doubtful we would win given our mutual track records. Neither Neil nor I traveled in the circles of the people who decides to a great extent who is in and who is not. The award for our category is held earlier in the afternoon in pre-telecast ceremony and is not a part of the larger Grammy awards television special that occurs later in the evening. I must say we were all very well turned out; me, my wife Jenice, Neil and his wife Pegi all looked mighty fine. Our party included Neil’s long time manager Elliot Roberts who led our cheering section. We were seated and the celebration started with our category coming early in the proceedings. I will never forget when they announced our category and said “The Grammy goes to Gary Burden, Jenice Heo and Neil Young”. Before they finished the announcement we were all on our feet and heading down the aisle led by our fearless leader Neil. OMG! We won! All coolness evaporated and we were jubilant. Everything seemed to be in trippy slow motion, but we made it to the mic and Neil asked me to give the acceptance speech. I got half way through what I was saying and lost my cool when I mentioned our long time co-worker and friend Larry Johnson who was responsible for creating the Blu-Ray version of the box set. Larry had been in our family for many years ever since I first met him when we were both working on the Woodstock album. He was the academy award nominated sound man on the film and I was there to look at footage and pull images for the album package. We became friends and I remember the two of us raging around Hollywood in my tricked out 1967 Mini Cooper high as kites. I later hired Larry to be a part of the film crew on a documentary film I was directing of the 1972 Crosby, Stills, Nash and Young tour. We went on that tour and made some of the greatest rock and roll film footage I have ever seen. Ever. Alas, that film was never to be and my dreams of being a film director went out the door with it. Larry went on to work with Neil on all of the films and videos he has made. When I mentioned Larry in my acceptance speech I broke down sobbing because Larry had died suddenly from a heart attack a month earlier. But there we were, my wife and my best friend Neil and I had just won a Grammy for our work. How sweet it is. Neil was also nominated for best rock album 2010 in a field of heavy contenders so we stayed for that part of the ceremony. Unfortunately, Neil didn’t win maintaining his perfect record for never winning a Grammy for his music so we left right afterwards. We had been invited to several posh after parties but chose not to stay for the big Grammy awards show. Instead we opted for a quiet dinner and called it quits early. It was a very cool evening and any reservation I had about the Grammys went into the background that night. In 2011, Neil was nominated for a Grammy for best rock vocal and...he won. His streak is broken. Jenice and I each have our Grammy awards sitting on top of the bookshelves in our studio. Perfect golden bookends. Gary, congratulations on your Grammy. You should be so #$%! proud! Here's wishing you lots of luck come January. Will you be going to the Grammy's? Hope we see you on stage. Rock on. Gary ~ I was checking out your very cool new website for the first time and discover that you have been nominated for your 4th Grammy... Wow!! Congratulations to You, Jenice and Neil!!! My guess.. is that you all will be on that stage come Grammy night... Best of Luck! Gary, Jenice and Neil.... Congratulations on the Grammy!! Well done. You rock! I'm so happy for you, and proud of you! Congratulations Gary, Jenice, and Neil!!! How cool is that ?!!! Very well deserved!!! Grammy W H A M M Y>>>can't wait to archive this good-looking archive!!!! C O N G R A T U L A T I O N S Rtwerk: Jenice and Gary and Neil. Congratulations Gary and Jenice. The hard work and long hours you put into this project were well rewarded. congratulations to you all on the Grammy - - I would love to see a picture of you in the '69 sequin Elvis Suit. Congratulations from Paris, Gary ! Looking for you on Facebook and found your web page. Very coolll! How goes life? I was recently informed that we are kin. I think it is truely great to see your work.